The show is a combination of the best an old-time revival meeting, a self-help seminar, and a variety show. You might ask ‘does Pearle Harbour really make every single person in the audience feel as if she loves you?’ You betcha! Except when, every now and again, the ‘mask’ slips and you might wonder, just a tiny little bit, if she really does. The show is in the Passe Muraille Mainspace but it’s the Mainspace like you’ve never seen it before. You go in a side door and inside the dimly lit interior, which feels cavernous, there’s an old-fashioned tent with a peaked roof. I love the soft, golden glow that tents have when they’re lit inside, it’s so inviting. Pearle Harbour is gorgeous. The perfectly fitted jacket and the co-ordinated pillbox hat both set off by the right amount of way too much glittery jewelry is stunning. And her make-up is sublime. I know, I’m shallow, but hey, it’s the first thing I noticed. She involves the audience in the show right from the beginning with a “you betcha!” call and response and then by walking through the audience and shaking hands with everyone, or touching hands. In my case her foot touched my hand because I was sitting in the back corner and was hard to reach from the aisle. We also did some breathing. We did that quite often during the show. Her approach to audience participation is the best. Rather than calling for volunteers she just approaches the person she’s chosen and tells them what to do. It’s done in a way that no one would think of refusing. Part of the show was a play performed by puppets and the puppeteers were chosen this way, seemingly at random from the audience. They were very good. She’s very funny but there’s a lot of truth in what she says. She reminded us that the world outside was out of harmony but that inside the tent we could be in harmony with each other. I believed her. 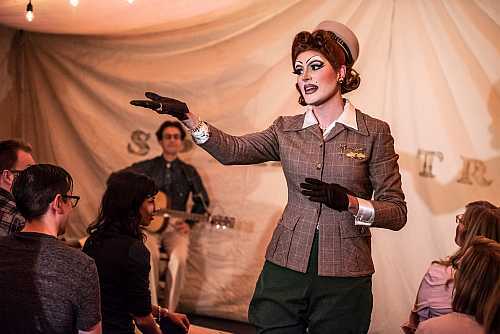 Pearle Harbour’s Chautauqua was written and performed by Justin Miller, a Toronto theatre artist and drag queen. Sometimes after I see a solo show I can imagine someone else performing it. I can’t imagine anyone else performing this. I loved it. And I left feeling better than when I arrived.